Today I received a lovely reply from Belgium. I had written to King Philippe of Belgium earlier this month for his 57th Birthday. 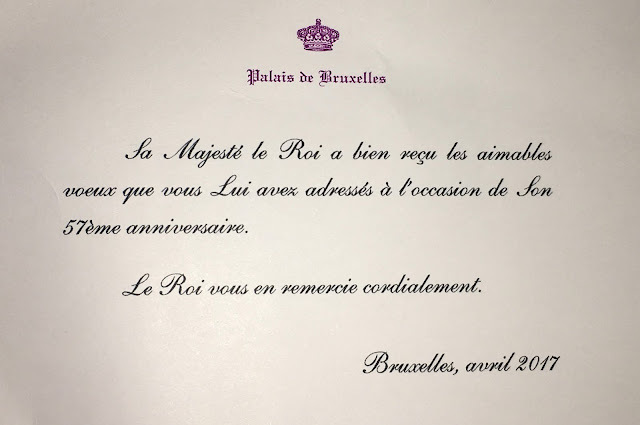 The card is similar to Queen Mathilde's Birthday reply from this year & last year's, except her card was accompanied with a photo. I did write to King Philippe last year for his birthday, but the reply I got wasn't exactly a birthday reply. His Majesty the King has received the kind wishes you have sent him on the occasion of his 57th Birthday. The King would like to cordially thank you. What I said was don't let your family make you miserable, taking up the bottle. You know your mother was concerned about one of her relatives prone to being an alcoholic. She thought you might have it in your genes. You can be strong -- you're better than that. Yeah, I wouldn't think they would reply to a letter suggesting they drink to solve their problems. Especially one that belittled other members of the Royal Family. Or that suggest Alcoholism is a result of one's weakness. And also how young was William then? Cause if you were suggesting underage drinking they would view that as highly inappropriate. BTW, do you know of an English translation of the biography of King Philippe of Belgium? Has it just circulated in Belgium only? I read people talking about it online. It can't be all negative. Have you seen it? What's your opinion of it? I haven't hear anything about a controversial King Philippe Biography.